There's only a handful of branded gaming PCs out in the market. Usually, gamers have to custom built their PC or look for a branded clone with the specifications they need. HP hopes to push innovation in the desktop PC industry by introducing the HP Blackbird 002, a gaming PC designed by gamers. The HP Blackbird 002 has a love it or hate it design, depending on your perspective. The Blackbird CPU is set on a single cast aluminum foot that can support up to 600 pounds, making the Blackbird 002 look like it's hovering in mid-air, and while most CPU chassis is made of plastic, the Blackbird 002 has a cast aluminum chassis that is significantly sturdier and more lightweight. Since the Blackbird 002's chassis is made from aluminum, it can withstand corrosion and is non-magnetic, making sure that it can withstand almost anything. 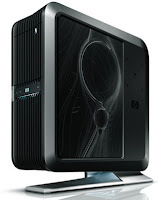 The HP Blackbird 002's hover design is useful for airflow. The elevated case pushes air through the bottom side vents that allows airflow, cooling the PC's interior. Another feature of the Blackbird 002's design is that instead of unscrewing bolts and sliding the side panels to open the case, you only have to pull a latch and the side panel will swing open on its hinges.